USFS Whitney Zone fee, guides climbing and safety gear, tents, cooking gear and 1 dinner, climbing helmet (reservation required). Personal items on gear list, 2 trail lunches and one breakfast. Operating on a non-discriminating basis under Special Use Permit, Inyo National Forest. 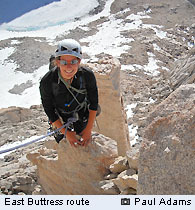 The East Buttress route is easier and more straight forward than the East Face route. It follows a more direct line very close to the line of the Buttress itself. The climbing is sustained upper class 4 and easy 5th. A few harder variation pitches exist and should be considered "optional" to the original route. From Whitney Portal (8,268') we begin via the "old trail" directly to the North Fork of Lone Pine Creek. The recently relocated climbers path on the northside of the creek makes travel easier than it used to be. After a few creek crossings we find the Matterhorn shaped boulder that marks the access to the infamous Ebersbacher Ledges. This is the class 2-3 passage that allows reasonable access to bypass the alder-choked steep drainage of the North Fork. These ledges require attentive climbing with an overnight pack and impecable route finding (provided by your guide) to keep the ascent as safe as possible. After a bit more ascent of the steep northside of the canyon, we arrive at Lower Boy Scout Lake with a feeling we have arrived in the true "high country" (about 3 hrs). 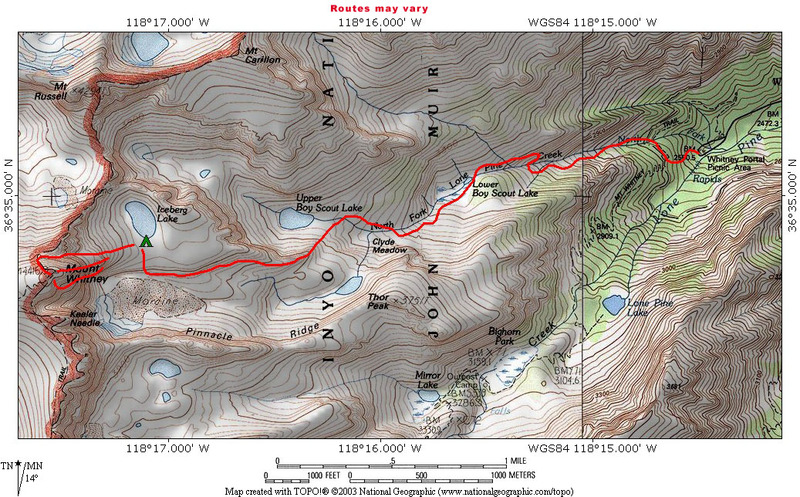 From here we ascend a large talus slope, cross a creek above a waterfall and around to Upper Boy Scout Lake (4 hrs). We continue our ascent rounding a corner to the sudden close-up view of the East Face of the Whitney Massif. This memorable view is of world class grandure. Continued path through scree and talus takes us either the Waterford route or the sandy ascent option to our highcamp at Iceberg Lake (6 hrs). This strenuous approach is challenging both from the pure elevation and the elevation gain as well. However, it is rewarded by one of the most spectacular climbers camps in the world. It makes the entire trip far more interesting than camping anywhere lower on the route. From Iceberg Lake, we follow the line of least resistance up the talus slope and a few shallow chutes to the notch between First and Second Tower. The first pitch climbs the face of Second Tower to near its top, then traverses to the right and around to the notch behind Second Tower. The next pitch requires a delicate move or two. Easier climbing continues directly to the Peewee, an unmistakable large perched block directly on the prow of the Buttress. After passing the Peewee on its right side, easier rock is followed to the summit area where the route intersects the East Face route, about 10 pitches (4-5 hrs from Iceberg Lake). From the summit, we descend the sloping plateau to the west. We choose one of two descent variations of the Mountaineer's Route depending on the amount of snow or ice in the upper chutes of the north face to the prominant notch that gives access to the east facing couloir. We descend this couloir back to Iceberg Lake (2 hrs). We mostly retrace our ascent route back to Whitney Portal with the exception of one varriation below Iceberg Lake (4 hrs from Iceberg Lake). Cardiovascular conditioning: prepare with at least 3-4, 40 min+ aerobic workouts per week including hill running, biking, or hard-hill hiking with a pack and ski poles. Strength training for upper body including pullups and practice climbing. Pre-climb acclimatization recommended to include hiking and sleeping at 8,000' or higher 1 or 2 days before the climb.